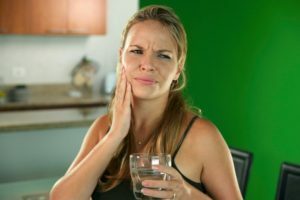 What Causes Sensitive Teeth? How Can You Find Relief? When you dig into a bowl of ice cream or sip on some steaming hot coffee, do you feel a little twinge in your pearly whites? If so, you’re not alone; countless individuals face the daily discomfort of sensitive teeth. This issue can rob you of the ability to fully enjoy your favorite foods. What causes tooth sensitivity, and how can you fix it? Let’s talk about these important questions. Teeth have a few layers. On the outside, there is the enamel, which is a hard, mineralized substance that is designed to protect the layers beneath it. However, if the enamel becomes worn down, decayed, or otherwise compromised, outside substances can irritate the dentin (the layer beneath the enamel, which has tubules that connect to a tooth’s nerve). The result of this irritation is sensitive teeth. Many people find that desensitizing toothpaste helps them find relief from their pain. These products contain ingredients that stop the nerve inside of a tooth from transmitting pain signals to the brain. However, toothpaste is not a miracle cure for sensitivity. The best thing you can do is visit your dentist so they can determine exactly why your teeth hurt. They can coach you on how to adjust your habits to minimize sensitivity and prevent further damage to your teeth. If your teeth are decayed or badly worn down, you may need fillings, crowns, or other restorative treatments to end the sensitivity. Some patients with sensitive teeth are candidates for Varnish XT, a special coating that your dentist applies to your teeth. The varnish is a resin-modified glass ionomer that contains fluoride, calcium, and phosphate — all minerals that help to strengthen tooth enamel. It is hardened with a special curing light so it provides firm protection for your smile. Varnish XT releases fluoride over time to provide continual fortification for your enamel. It can allow you to enjoy popsicles, steaming hot coffee, and other goodies without worrying that your teeth will punish you for it. The Varnish may remain on your teeth for as long as 3 – 6 months before you need another coating of it. Do you struggle with sensitive teeth? Visit your dentist to learn how you can find relief and get back to enjoying all of your favorite foods. Drs. William Herr, Andrew Luccio, and Trinh Vo are proud to lead the team at Capron Park Dental. They deliver a broad range of general dentistry services to maintain and repair smiles in the Attleboro community. To learn more about how they can help you cope with sensitive teeth, contact our office at 508-222-5950. Comments Off on What Causes Sensitive Teeth? How Can You Find Relief?